I feel compelled to post a heartfelt and personal tribute to a well known chef, distant mentor, and advocate for honesty and integrity in the world of food culture. Anthony Bourdain was an inspiration to me, like so many others. Most certainly it is true that our industry asks a lot of us. We are required to sacrifice one of the most important attributes of life. Time. We sacrifice time with our family, many hours, months, weeks, and years giving much of ourselves to people we don’t really know. We, as passion driven cooks, do so with woe-full abandon in the hopes to nurture the commonality of the need to eat. Many of us discover that what we are asked to do is set aside the “normalcy” of a 9-5 “job”, consistent days off, birthdays, holidays, weekends, working late nights and not really having vacation time(especially during the much anticipated summer in our beautiful region). We deal with stress, unforeseen circumstances out of our control, staffing woes and fatigue. The industry has been plagued with lower than average wages for a career, making the reality of family stability, home ownership, and general sanity a bit more challenging than it should be. When I signed up for this ride 21 years ago, I was fortunate to have many inspired mentors share their knowledge, time and patience to help me on my path to becoming the cook I thought I wanted to be. My goals have changed many times, as have the places I have lived, as well as the people I worked with and for. The only thing that has never changed is my love of my craft, and the opportunity with these years of experience and mentorship to make people happy through my culinary skills. My hands are my greatest tool, seconded by my desire to do better, learn more, do more. It has been far from easy, and to be honest I have had some very rough learning experiences that shaped me into my current role of father, farmer, entrepreneur, and mentor myself. I needed to go through these tough times, and at the end of it, knowing that the next unforeseen challenge will be a bit easier than the last. I am so incredibly grateful for the successes and failures, but mostly for those people in my life who choose to stand beside me during my pursuit of what success means to me. With this said, I wouldn’t change a thing. My personal and professional evolution has been based upon learning from my mistakes the best I can, knowing that if time could go backwards, I may have chosen to deal with certain situations differently. I have learned most importantly that I need to go to sleep every night knowing that I did the best I could given the circumstances, and I am human-we are most certainly driven just as much by emotion than anything else. I try to do right by my family, my friends employees and clients, and inevitably when “bad days” happen, I consider them important to remind me how fantastic the great days really are(and they are plentiful). I can attest that this is not always easy, but there is so much in my life to appreciate. I try not to burden myself by competing, or comparing what I am striving to do with anyone, anything or anywhere else. I also try not to take for granted the opportunities that were presented to me in both life and career, and make the most of them. Sadly, things can get overwhelming and overcome the best of us. Perhaps the loss of Anthony Bourdain is a testament that we just don’t always see the inside, or recognize the pain that can manifest inside someone who we look up to, respect and admire, simply assuming they have the world in the palm of their hands. Justifiable reasoning is as individual as each and every one of us. 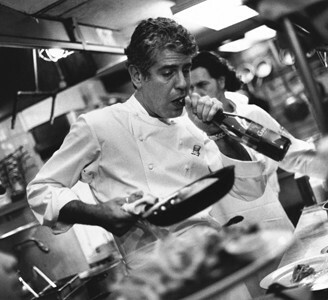 If you are reading this, my hope is that you will join me in recognizing how this iconic chef chose to live his life, rather than how it ended. Perhaps we can also appreciate that he set aside the “edited fluff” for honesty. He chose to share the “grit” of his experience in the kitchen and culinary industry, perhaps to raise awareness to those who may never see it themselves. I haven’t battled many of the demons that shaped him, but I still have had my share as I believe we all do-no more significant, yet no less. I appreciate that he shared his story with honesty and integrity, while not feeling shame for the choices he made when he made them. Strange to reflect on the life and death of an icon whom I have never met, and never will. With this said, his writing and presence helped shape my career and coerced me into looking a bit deeper into what my personal life and culinary career has inevitably become. He broadened the view of food culture worldwide, the people behind the food and the unbelievable diversity in what we all have in common. We need to eat, and perhaps we should be a bit more aware of where we eat, who we choose eat with and where our food is coming from-not to mention those who choose cook it for us. As one of those who built my life, business and career around this sentiment, his contribution is profound. Rest in peace Chef, and thank you for helping bring more recognition to all aspects in the culinary industry. In life and in death, his contributions will continue to inspire me in sharing my love of family and food culture to our guests on my terms. A sad day for many of us true cooks, but maybe we should ask each other “how we are doing” more often, and perhaps listen a little bit closer. My ear is always here to lend should you need it.